I'd been meaning to scan in a copy of the this character sheet for some time. I think I bought a A4 pad of them in Game Workshop (copyrighted at 1982) so it's possible that there were really for the next edition. The major difference between this and the sheets in my copy of RQ2 is the removal of the Power stat block. 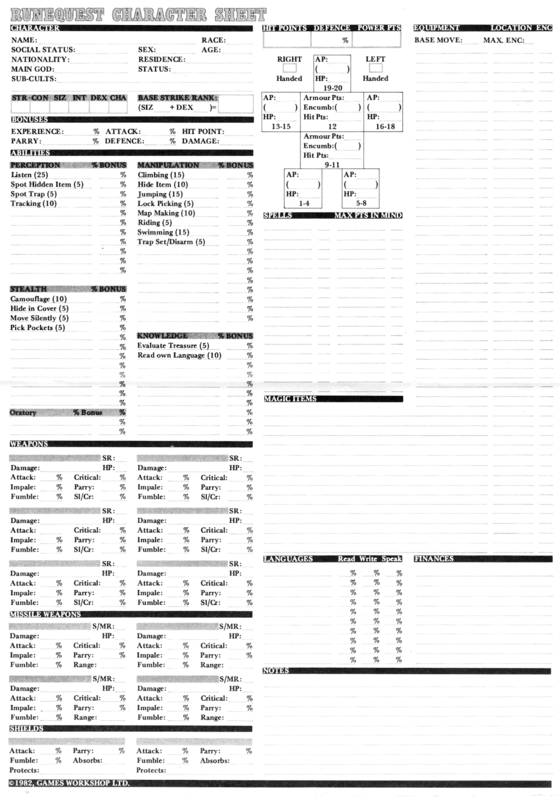 When I first saw the D&D3 character sheets they immediately reminded me of the sheets from RQ and CoC - mainly because of the inclusion of skill lists and lined blocks. 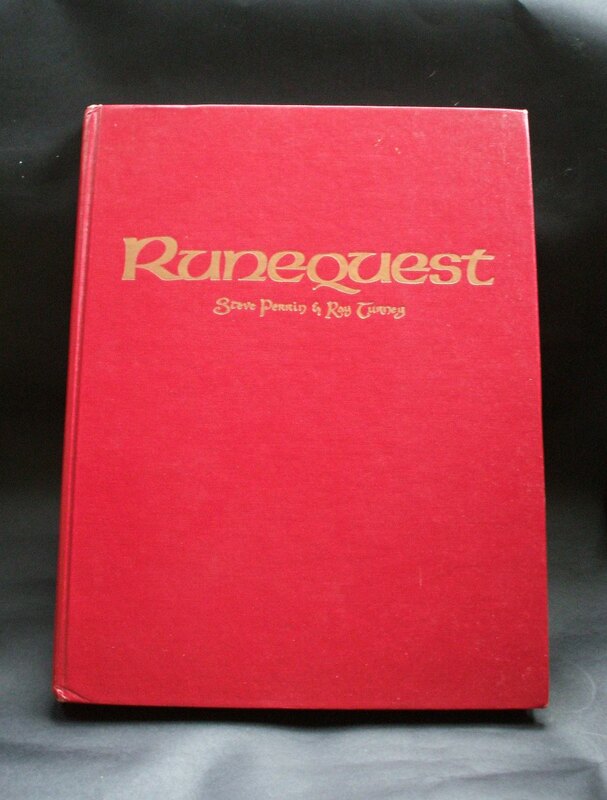 I've given up trying to understand the numbering of the different editions of Runequest - although I found this history useful (but I can't find a mention of the GW 80s UK hardback rewrites for RQ and Advanced RQ). There's talk across the frequencies of a sixth incarnation. 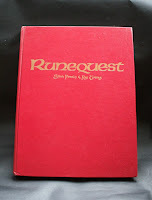 My only copy of Runequest (not counting a downloaded version of the Mongoose SRD) was picked up in the early 80s (1984 I think). To this day I have no idea if the pile it was from was seconded stock or second hand, stickers had already been applied and then removed, the most recent print date inside was 1980. It was just a little battered, so probably second hand. Certainly, it's still one of my oldest gaming possessions to date. To my Basic D&D trained eyes it looked complicated and yet the tables were fascinating. At the time RQ was seen as an attempt to be more "realistic" in combat than D&D or AD&D, because it had hit locations, fumbles and criticals, but AD&D was still king (according to the polls in White Dwarf at the time). Only in really recent years did I discover that one of the OD&D supplements contained very similar hit location rules and monster body types. I genuinely thought that hit locations were a Chaosium Runequest invention, perhaps it was a simultaneous development. To me RQ did look more complicated roll by roll, but I realise that the edition I own is possibly far simpler than D&D3-4. One of the problems was the order of the rules in the text. We sometimes forget how sophisticated modern rulebooks are when it comes to introducing basic mechanics (or the "dumbing down" of rules ;) ) whilst also functioning in a logical way for reference. However, there were a few inspired "example" side boxes, where we followed an adventurer called Rurik on his quest to acquire runes of power (a strangely specific objective). Also the emphasis on characters having to be in Cults confused me. On first reading it seemed like a desert world of clerics. Also, I was very into creating my own worlds, and this edition seemed to be fused with the Greco-Roman themed Glorantha. If I played it now I would certainly have more confidence to "re-own" the game and bend it to my personal whims. 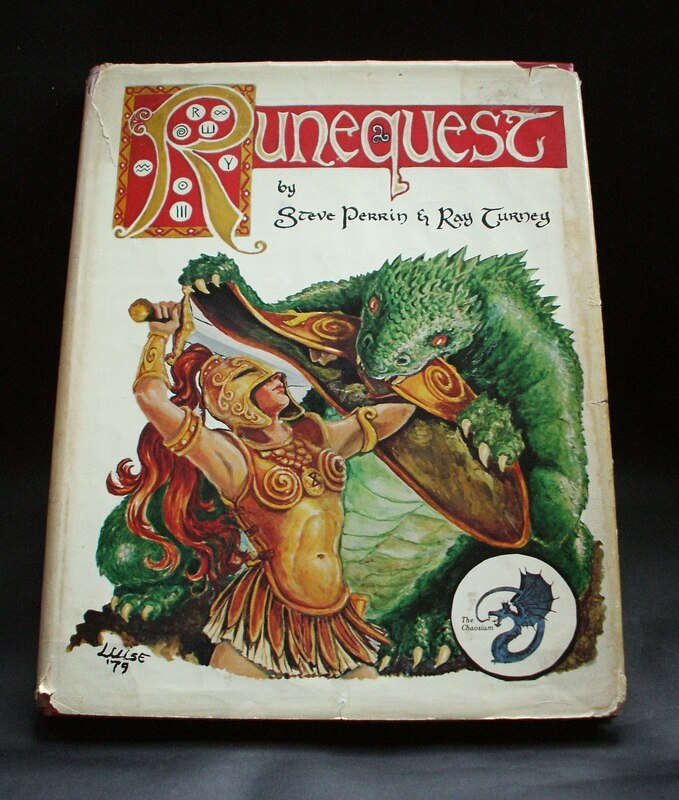 Wow, this brings back some memories, I had just about everything from RuneQuest that was released back in the day. Early - Mid 80's saw a lot of RQ gaming. 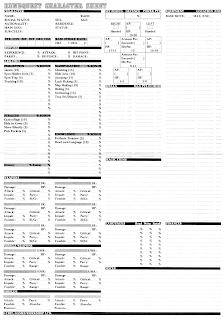 I recently acquired a scan of the GW character sheet, courtesy of one of the members of the Gringle's Pawnshop forums. It really brought back memories - I can't begin to count how many of these I filled in over the years. The GW sheets were by far my favourite, better even than any subsequent editions. They may look complicated (next to a B/X sheet, anyway), but a 1-page character sheet for a game like RQ is no mean achievement. As for RQ6, well, I guess you know that it's out now. I've got a copy, and it's a very nice book.